Brazil, also known as Hy-Brazil, Hy-Brasil, or several other variants, is a phantom island which features in many Irish myths. It was said to be cloaked in mist, except for one day each seven years, when it became visible but could still not be reached. It probably has similar roots to St. Brendan's Island. The names 'Brazil' and 'Hy-Brazil' are thought to come from the Irish Ui Breasail (meaning "descendants (i.e., clan) of Breasal"), one of the ancient clans of northeastern Ireland. cf. Old Irish: island; bres: beauty, worth; great, mighty. It appears that as the north Atlantic was explored, the name of Brazil may have been attached to a real place. A Catalan map of about 1480 labels two islands "Illa de brasil", one to the south west of Ireland (where the mythical place was supposed to be) and one south of "Illa verde" or Greenland. Expeditions left Bristol in 1480 and 1481 to search for it, and a letter written shortly after the return of John Cabot from his expedition in 1497 reports that land found by Cabot had been "discovered in the past by the men from Bristol who found Brasil". Some historians claim that the navigator Pedro Alvares Cabral thought that he had reached this island in 1500, thus naming the country of Brazil. However, Cabral didn't choose the name 'Brazil'. The country was at first named Ilha de Vera Cruz (Island of the True Cross), later Terra de Santa Cruz (Land of the Holy Cross) and still later 'Brazil'. The generally accepted theory states that it was renamed for the brazilwood, which has an extreme red color (so "brasil" derived from "brasa": ember), a plant very valuable in Portuguese commerce and abundant in the new-found land. The island has also been identified with Terceira in the Azores, which was at one time named Brazil, while another phantom island sometimes known as Brazil was the Isle of Mam. Others claimed to have seen the island, or even landed on it, the last supposed sighting was in 1872. 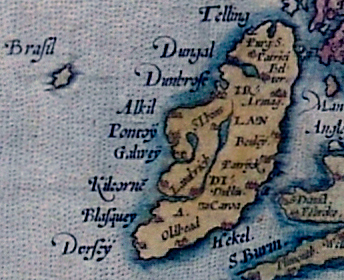 O'Flaherty in A Chorographical Description of West or H-Iar Connaught (1684) tells us "There is now living, Morogh O'Ley (Murrough O Laoi), who imagins he was personally on O'Brasil for two days, and saw out of it the iles of Aran, Golamhead, Irrosbeghill, and other places of the west continent he was acquainted with." On maps, the island was shown as being circular, often with a central strait or river running east-west across its diameter. Despite the failure of attempts to find it, it appeared regularly on maps lying south west of Galway Bay from 1325 until 1865, by which time it was called Brazil Rock. It has also been identified with Porcupine Bank, a shoal in the Atlantic Ocean about 200 kilometers (124 mi) west of Ireland and discovered in 1862. As early as 1870 a paper was read to the Geological Society of Ireland suggesting this identification. The suggestion reappears regularly since, e.g. in an 1883 edition of Notes and Queries and in various publications in the twentieth century, one of the most recent being Graham Hancock's book Underworld: Flooded Kingdoms of the Ice Age. On December 30, 2010 History Channel episode of Ancient Aliens, premiered 'Alien Contacts'. Retired USAF retired TSgt and James Penniston and retired TSgt. John Burroughs described an incident with a triangular UFO on December 26, 1980 in the forest near Bentwaters. RAF Bentwaters, now known as Bentwaters Parks, is a former Royal Air Force station about 80 miles NE of London, 10 miles ENE of Ipswich, near Woodbridge, Suffolk in England. The name was taken from two cottages (Bentwaters Cottages) that had stood on the site of the main runway during its construction in 1943. It was used by the RAF during World War II, and by the United States Air Force during the Cold War, being the primary home for the 81st Fighter Wing under various designations from 1951 to 1993. For many years the 81st Fighter Wing also operated RAF Woodbridge, with Bentwaters and Woodbridge being known as the "Twin Bases". Bentwaters is also known as the location for the alleged December 1980 UFO incident in Rendlesham Forest. Around 3 a.m. on December 26, 1980 strange lights were reported by a security patrol near the East Gate of RAF Woodbridge apparently descending into nearby Rendlesham Forest. Servicemen initially thought it was a downed aircraft but, upon entering the forest to investigate, they saw strange lights moving through the trees, as well as a bright light from an unidentified object. One of the servicemen, Sgt Jim Penniston, later claimed to have encountered a "craft of unknown origin" and to have made detailed notes of its features, touched its "warm" surface, and copied the numerous symbols on its body. The object allegedly flew away after their brief encounter. Penniston also claimed to have seen triangular landing gear on the object, leaving three impressions in the ground that were visible the next day. On the History Channel, Penniston described the crafts dimensions as 6.5 feet tall with 9.8 foot sides. He equated the unusual markings and symbols on the craft like Egyptian hieroglyphs. When he touched the craft, he telepathically received a message in the form of binary code, which he wrote down in a small note book shortly after the incident, telling no one about it for three decades. In October 2010 the 6 small pages of Binary Code were translated by Internet programmer Nick Ciske then presented on December 30, 2010 History Channel broadcast. Below is the message followed by navigational co-ordinates that pinpoint Hy-Brasil. It is said to be the home of an advanced ancient civilization. Hy-Brasil is occasionally referred to as "The Other Atlantis". According to David Wilcock, the people of Hy-Brasil used sound and vibrational technology reminiscent of legends from Atlantis.